This is the last of these Virtual Paintout Pix I will be doing in Ammon's Mole. This was made, as were all my virtual paintout pix, from a google streetview. As you can see, I changed the design of the towels and changed the brick to stone. Also, I had to crop a vertical (portrait) out of a horizontal (landscape). They YELLOW is primarily from the stupid Yellow paper!!! (I prefer white paper!) (That was why I put white gouache in a few places! If anyone wants to participate in the Virtual Paintout, it's Elba for the rest of February. 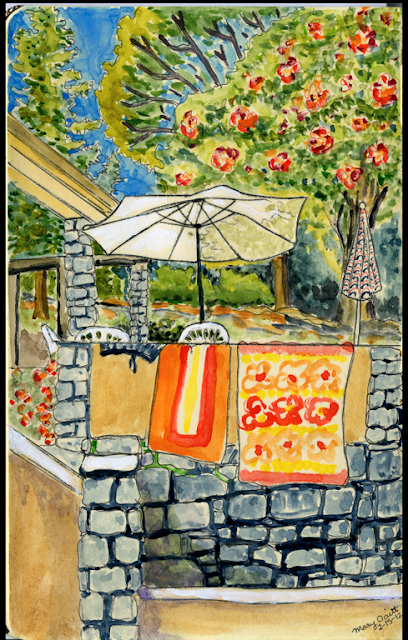 You can do it on your own, or you can do it with Virtual Paintout, which is currently in Elba. Mary, this was fun to see in person. You did a wonderful job! I like doing the Virtual Paintout things, other than the difficulty of finding something I would enjoy painting.